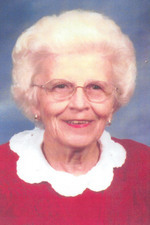 Lera Burke Obituary - Newport, Arkansas | Jackson's Funeral Homes Inc.
Lera Louise “Lou” (Franklin) Burke (94), of Fayetteville, formerly of Newport, AR, passed away on Sunday, February 3, 2019 at North Hills Life Center and Rehabilitation in Fayetteville, AR. She was born on September 13, 1924 in Hamburg, AR to Luther and Brunette Franklin. Lou was preceded in death by her parents; her husband of 53 years, Doyle K. Burke; Her brothers Richard Franklin and wife Mary Frances, and Raymond and wife Ruby. Survivors include a daughter, Ann and husband Jerry Roblyer of Placitas, NM; a son, James (Jim, Jimmy) L. Burke and wife Lynda (Matthews) Burke of Fayetteville, AR; one granddaughter, Jennifer (Yarborough) Teller of Phoenix, AZ; two Grandsons, James Matt Burke of Fayetteville, AR and Robert Kenneth (Bobby) Burke of Piedmont, OK; four great granddaughters, Chloe, Sophia, Zoe and Josie Burke and two great grandsons, Landon Burke and Darian Caulkins of Phoenix, AZ. Lou was a member of Newport’s Methodist Church during the entire time spent in Newport. She served on several church boards. Lou graduated from Hamburg High School; she received a B.B.E. from the University of Arkansas – Monticello (A & M); and a M.S.E. from University of Central Arkansas (State Teachers College). Lou taught elementary schools, special education, and remedial reading at Crossett, AR, Sherrill, AR, Smackover, AR and Newport for 37 years. She was selected Outstanding Teacher of America in 1995. Also, she received several awards and served as President of the Jackson County Retired Teachers Association. Lou served on the Board for the White River Agency on Aging For several years after completing her husband’s term following his death. She also served on the Board for Crowley’s Ridge Development Council. She was known for providing the home-made desserts at Board Meetings! Lou touched the lives of everyone she came into contact with. Special thanks for the special staff at Eagle Mountain Assisted Living in Batesville, AR, Brookstone Memory Care in Fayetteville, and North Hills Living Care and Rehabilitation in Fayetteville, AR. Every who knew her said she was their favorite! She had a few rough years in her later life but her many previous, full life years more than made up for the rough times. Friends may visit at the funeral home, Wednesday, 7:00-9:00 p.m. Funeral services are 10:00 a.m. Thursday at Jackson’s Newport Funeral Home Chapel, with interment following in Walnut Grove Cemetery. Arrangement s by Jackson’s Newport Funeral Home.